Every month since September 1997 we have hosted a Discovering Ingleside Membership class. It’s the way you join our church and commit to membership. The class is typically on Sunday afternoon from 4:00 – 8:00 p.m. (a complimentary snack supper is served). This month, as usual, the class will be on Sunday afternoon, April 15. Options this month. In addition, for those of you who have not been able to make the Sunday afternoon class, this month only we are offering the class on two successive Wednesday nights – April 11 and 18 – at 6:15 p.m. in room F-300 (over the east entrance to the worship center). Part 1 is the first week. Part 2 is the second week. So, attendance on both Wednesday nights is necessary to complete the class. As you know, both the word and the concept of church membership is biblical. As the Apostle Paul wrote to the church at Corinth: “Now you are the body of Christ and individually members of it” (1 Corinthians 12:27; cf. Romans 12:4-5). Missions options too. The regular Missions Orientation class this month is on Sunday afternoon, April 15, at 4:00 p.m. This month only we will also offer our Missions Orientation class on the same two Wednesday nights as the additional membership class, April 11 and 18, at 6:15 p.m. in room F-602. 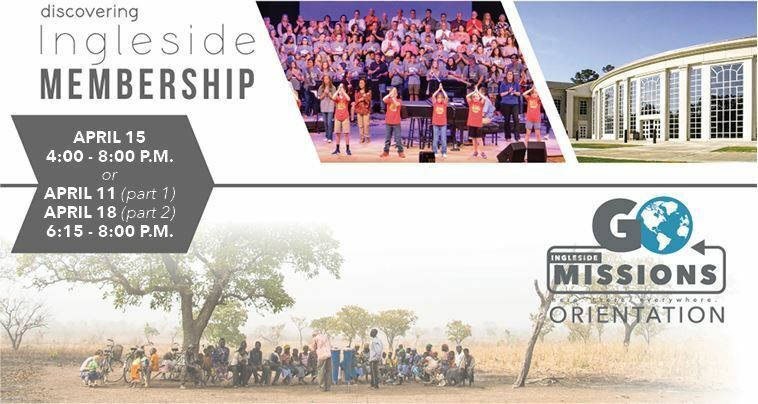 The Missions Orientation class prepares you to go with the gospel on an Ingleside mission trip. I hope you will plan to be in the Membership or Missions class this month!